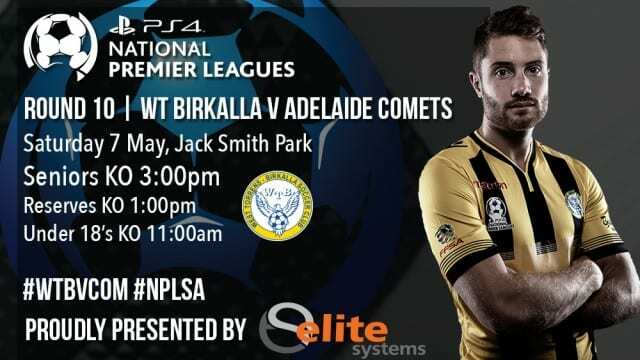 Round 10 of the PlayStation 4 National Premier League South Australia promises another exhilarating group of matches, with the highlight of the round being the contest between fourth placed West Torrens Birkalla and third placed Adelaide Comets at Jack Smith Park. Birkalla come into the match with a little spring in their stride after a solid 3-1 victory over league leaders Adelaide City in Round 9. While Comets will be looking to flex their muscle early in the game, after squandering an opportunity to take maximum points in a game they had total control of against Blue Eagles in their last outing. Comets will sorely miss the influence of midfielder Steven Grelli, a quad injury will keep the talented player on the sidelines for at least another week. Coach Theo Tsiounis will turn to Theo Balmenos to fill the vacant midfield role alongside Christopher Pepe and the gifted Jack Bladen. Bladen poses the biggest threat for Birkalla in the middle of the park, his poise, finesse and creativity on the ball if allowed to go unchecked will be the major difference between the two sides. Birkalla have a few weapons of their own, Chris Skull, Ian Kamau, Fumiya Suzuki have been good contributors in the middle third of the park, while Tom Dittmar, Adam Le Cornu and John Paul Cirillo have been solid in defence. A worthy mention for young sixteen-year-old Ryan Yates who has been more than impressive in his NPL appearances this season. Comets may hold a slight edge up front with Andreas Weins and Apostolos Stamatelopoulos proving to be an elusive duo in front of goal. On the other side of the ledger Birkalla will be without their star striker Paul Radice who will serve the last week of a suspension. Solid Birkalla defender Tom Dittmar holds no fear going into Saturday’s game. He said that the team is full of confidence, following a strict game plan and playing to their strengths. “After last week’s win the boys are up and about and feeling good. The confidence is building and we are all playing as one,” Dittmar said. Dynamic midfielder Jack Bladen said Comets go into the contest positive but cautious at the same time. He knows that if they take Birkalla lightly they will be made to suffer. “Individually their front four a very good so we need to be strong in defence and through the middle” Bladen said. This is a crucial game for both teams as we near the back half of the season, and both will be looking to consolidate a place in the top four. In what shapes to be an enthralling game between two immensely talented teams, one expects the result will be in the balance for the majority of the ninety minutes, making supporters a little nervy during that time.